What would the world be today without reading glasses? It isn't difficult to realize their impact on society as a whole. In fact, many may argue that reading glasses are among some of the most important inventions introduced within the last millennium. Who invented them? When were they introduced? how did they impact the world? Approximately in 1263 Roger Bacon, an English scholar and philosopher, was the first person to document how lenses could be used as an effective vision correction tool. However, according to the University of Texas, it wasn't until approximately 1286 that Bacon's idea was fully realized. 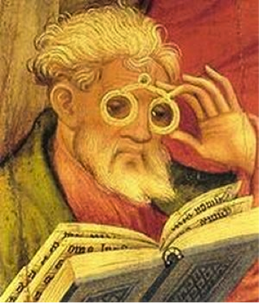 The first use of spectacles was observed in the late thirteenth century by Friar Giordano da Pisa on the occasion of a meeting with a craftsman living near Pisa, Italy. After recounting his story, a friend of Giordano, named Friar Allesandro della Spina, spent time learning how to replicate these spectacles, and shared his knowledge with the public. Arguably, this feat of engineering helped inspire a new industry. By the early fourteenth century spectacles (or reading glasses) were being manufactured and sold in Venice, and by the fifteenth century Florence Italy was producing some of the highest quality spectacles of the day and exporting them throughout Europe. The pioneers of spectacle manufacturing gave birth to some of the earliest models by simply using two convex glass disks enclosed in leather or metal rims with handles, riveted at the center. Although these spectacles were not as ergonomic as their modern day counterparts, they did provide some versatility, allowing the user to either clamp them to their noses or to simply hold them before their eyes. 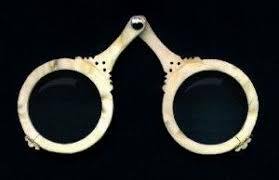 Although the style and practicality of these ancient spectacles may seem quite antiquated compared to today's more contemporary eye-wear, they shared the same basic functionality and purpose. For that reason it is clear to see how these early inventions played a vital role in the field of optometry.